Well well, once again my computer is trying to get the best of me. However, I skillfully won (?) and am here to write my post. My knitting has been quite productive the past week, I finished this cowl and my second hitofude cardigan is upstairs soaking away and waiting for me to lightly block it. So.....all that is left on the needles is my scrap sock blanket! I am thinking of what to cast on with all of these empty needles. I need some portable projects. 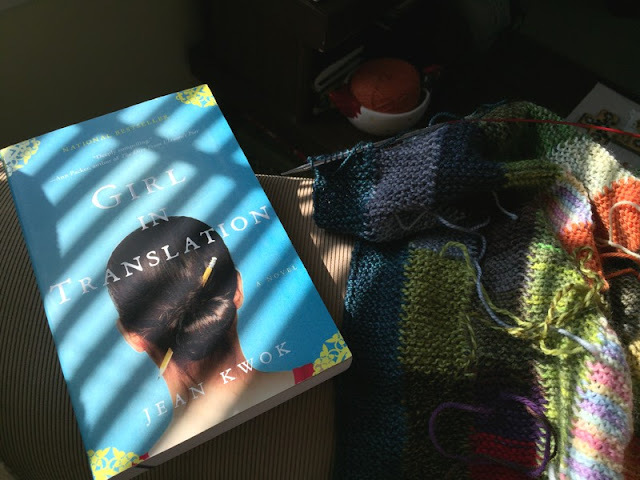 I started Girl in Translation by Jean Kwok. I bought this book a long long time ago and it's been patiently waiting for me to start reading. I finished Oh Pioneers over the weekend and enjoyed the novel. I must say I believe I've read that book, the ending was awfully familiar. Only one project on your needles? I see a cast on day coming up really soon, maybe a shawl or a sock? Looks like another great book recommendation too - the list just keeps getting longer! looking forward to seeing the new cardi! have fun picking a new project! Time to cast on!! One of the most exciting times as a knitter! I can't wait to see what you decide to make. I can't believe that you have knit two Hitofudes. They look so hard! I agree with Donna. I cannot imagine life without socks on the needles. Looking forward to what you think about Girl in Translation. I can't wait to see what you decide to cast on...Los looking forward to photos of Hitofude. Nice to see the blanket again! Can't wait to see the Hitofude. I haven't had a computer in ages. It's really slowed down my writing. Facing a whole blog post using only the phone, while doable, isn't that enjoyable. But I persevered today! And I'm always glad when I do. You always find the most intriguing projects. I can't wait to see what you decide on! Those are some really nice blues and greens happening there. :) Have fun picking a next project! I can't wait to make a sweater for myself and pick out a brand new pattern. Wee! Can't wait to see what you decide to put on the needles and your Hitofude! That book has piqued my interest. Happy Knitting & Reading! Girl in Translation looks good. Can't wait to see what you think of it. And the sock yarn blanket, I love the looks of this one. Looking forward to seeing your Hitofude. If you're looking for a portable project you can't go wrong with socks. wow cannot believe your sock yarn blanket is nearing the finish how exciting!!! I just set down some socks to pick my Twinleaf back up. I'm itching to cast on more, more, more! That little blanket it so lovely. I have seen that book around. Interested to hear how you like it. I try to always have a portable (and mindless) project for the on the go things. I remember and I bought it way back when because of the rave review!! Hm, probably, as I'm writing this, you've cast on another cardigan or shawl 😋 your blanket is coming along nicely (I saw it on Instagram)! I must put that book on my list... thanks. Frodo's gonna love his finished blanket!!! I'm really looking forward to seeing your hitofude, I have just purchased the yarn to make my own! It must be such a great feeling to actually have empty needles and picking something completely new to cast on. I cannot even remember the last time I had nothing on my needles (or even less than 5 projects on my needles for that matter).